This column will appear on April 2, 2016. Yesterday was April 1, or "April Fool's Day," the traditional date for all sorts of stunts and jokes. 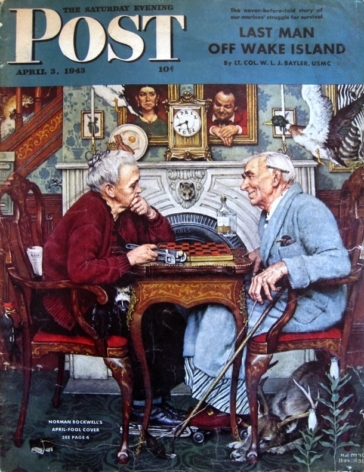 On April 1, 1943, the above Norman Rockwell drawing appeared on the cover of The Saturday Evening Post. Today's problem is more in the nature of a "thought" problem. 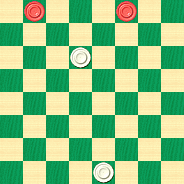 We know it's possible to construct positions that can't arise on the checkerboard. Here's one taken from "Impossible Settings" in Ben Boland's book, Famous Positions in the Game of Checkers. There are only four pieces in this position, but we'd like to challenge you to find the minimal position that can't possibly arise in play that follows the rules. Can you find an impossible setting with fewer than four pieces? The picture at the top of this article may give you a clue as to the answer. Click on Read More when you're done fooling with this and wish to see the answer. Yes, an empty board contains zero checkers, and you can't get any smaller than that! There's obviously no way it can actually happen, short of dumping the last lone checker on the floor, which we wouldn't call a legal move. Was this a suitable April Fool teaser? We hope you found it more amusing than annoying! And, in case you're wondering, here are the 43 errors in the drawing. The trout, the fishhook and the water, all on the stairway. The stairway running behind the fireplace, an architectural impossibility. Bacon and egg on the decorative plate. Ducks in the living room. Zebra looking out of the frame. Mouse looking out of the mantelpiece. A tire for the iron rim of the mantelpiece. Medicine bottle and glass floating in the air. Fork instead of a spoon on the bottle. The old lady's hip pocket. The newspaper in her pocket. Her wedding ring on the wrong hand. Buttons on the wrong aide of her sweater. Stillson wrench for a nutcracker in her hand. She has on ice skates. 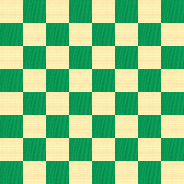 Wrong number of squares on checkerboard. Too many fingers on old man's hand. Erasers on both ends of his pencil. He is wearing a skirt. He has a bird in his pocket. He is wearing roller skates. He has a hoe for a cane. Billfold on string tied to his finger.